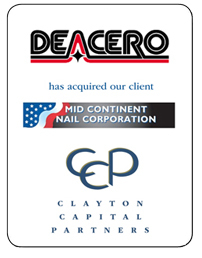 Mid Continent Nail Corporation to Deacero, S.A. de C.V..
Clayton Capital Partners is pleased to announce the sale of its client, Mid Continent Nail Corporation to Deacero, S.A. de C.V. Mid Continent Nail Corporation (www.magnumfasteners.com), based in Poplar Bluff, MO, is a leading manufacturer of industrial and construction fasteners. Deacero, S.A. de C.V. (www.deacero.com), with a presence in over 20 countries, is a world leader in the production and distribution of steel wire products. If you would like more information about this transaction or Clayton Capital Partners, please contact Kevin M. Short at (314)725-9939 x 525 or via e-mail at kshort@claytoncapitalpartners.com.